To help prevent plaque and gum disease such as gingivitis, all dentists recommend flossing the teeth as an important part of our daily oral health routine. But flossing using the string-like dental floss may be an awkward task for many as it may cause cuts and bleeding of the gum if not properly and carefully done. For those who dislike using dental floss and are looking for a better and gentler way of flossing, there is a good alternative: Using a water flosser instead of the string! A water flosser (also known as an oral irrigator) is a dentist recommended device that can be used to floss your teeth more effectively and more gently than when you use string-like dental floss. It is easier to use: All one needs to do is simply point the flosser tip between the teeth (along the gum line), and let the emerging water jet do the work for you. It is less abrasive: No more cuts or bleeding gums. It is more effective: Water flossing devices are able to remove all plaque and debris lodged deep between the teeth and below the gum line not easily reached with string flossing. It is faster: It takes only a minute or two to floss completely the whole mouth (all teeth and both gums). Countertop Electric: These are corded units equipped with a rather large water reservoir. The #1 and most popular unit in this category is Waterpik Aquarius Professional which had received an average of 4.5 star rating (over 5 stars) from Amazon customers at the time of this writing. This is an electric unit that needs to be plugged. It has a large water tank with sufficient capacity for more than one flossing ( 21oz equivalent to just under 3 standard measuring cups). The reservoir is connected to the handle with a flexible tube. The flow of water is controlled by a variable setting on the unit and a button on the handle (see picture below). Countertop Non-Electric Faucet Attached: These units have no reservoir and need to be attached to a faucet before they can be used. The most popular of these is Oral Breeze (marketed under the names of either QuickBreeze or RediBreeze) which had received an average of 4 star rating (over 5 stars) from Amazon customers at the time of this writing. Oral Breeze is directly controlled via your faucet knobs and does not require electricity to run as it is powered by the water pressure from the faucet. The advantage of this is that you can get the pressure as low or as high as you want by adjusting the water faucet knobs. 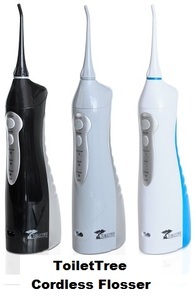 The Oral Breeze oral irrigator is of course detachable from the faucet. Cordless Electric: These are battery operated cordless compact devices. They hold less water than countertop units. The most popular brands/models in this category are the Waterpik Cordless Freedom (4 star), Panasonic Cordless Oral Irrigator (4 star) and ToiletTree Cordless Oral Irrigator (4 star). These devices contain a battery which is often rechargeable and have a water reservoir built into the handle. While these are usually as powerful as the countertop units, they tend to have fewer water pressure settings. These are ideal for those who do not have enough counter space in their bathroom or travel regularly (see pictures below). In this article we will compare the above mentioned Waterpik Aquarius, Oral Breeze, Waterpik Cordless Freedom, Panasonic Cordless Oral Irrigator and the ToiletTree Cordless Oral Irrigator water flossers so you may have enough information to choose the water flosser that will suit best your own flossing needs. As mentioned these are not just the most popular water flossers bought by Amazon custmers, they are also those that have received the best reviews from actual users. Oral Breeze flosser is not electric. It does not require to be plugged or any batteries. Waterpik Aquarius is electric and needs to be plugged using the provided cord. Waterpik Cordless Freedom, Panasonic Cordless and ToiletTree Cordless are also electric, but battery run (see Note 7 below for charging requirements). Having multiple tips is convenient and safe if more than one person would be using the flossing device. Also, as in the case of Waterpik Aquarius and Waterpik Cordless, different tips may be used for different purposes: Waterpik Aquarius comes with 7 tips (3 classic jet tips, and 1 pick pocket, 1 plaque seeker, 1 orthodontic, and 1 toothbrush tip). 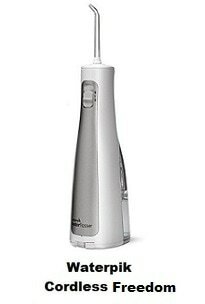 Waterpik Cordless Freedom comes with 3 tips (2 classic jet tips and 1 orthodontic tip). Waterpik Aquarius comes with an advanced pressure control system equipped with 10 settings. Waterpik Cordless Freedom and Panasonic Cordless have each two settings only. Oral Breeze has no settings as it shoots a steady stream which is directly controlled via your faucet knobs. The advantage on this one is you can get the pressure as low or as high as you want by adjusting the water faucet knob. The countertop unit Waterpik Aquarius has the largest tank of all: 21 oz equivalent to just under 3 standard measuring cups. The cordless units Waterpik Cordless Freedom, Panasonic Cordless and ToiletTree Cordless have smaller tanks that can hold about 3/4 to 1 cup of water. Oral Breeze has no tank at all as it is attached to the faucet. Waterpik Cordless comes with a nano-sonic toothbrush that can be used to brush the teeth. The toothbrush tip that comes with Waterpik Aquarius does not replace a regular toothbrush as it contains some very short bristles, just enough to help loosen food particles. It does not replace a true toothbrush because the bristles do not move, and any paste you may use would get flushed away by the water. The other three flossers do not come with a toothbrush. ​On the LED display panel of the Waterpik Aquarius flosser, you can easily see the flossing mode as well as other operational details. Panasonic Cordless is not rechargeable. It requires 2 AA batteries. Waterpik Cordless Freedom is not rechargeable. It requires 3 AA batteries. Oral Breeze does not require electricity to run as it is powered by the water pressure from the faucet. Waterpik Aquarius does not use batteries, but needs to be plugged to a wall power outlet. ToiletTree Cordless is rechargeable (a charging adapter is included). ​Note: ToiletTree has more recently released a new cordless flosser, the ToiletTree Poseidon. It comes with the same features as the ToiletTree Cordless compared above. But it also comes with an inductive charging cradle. You just need to sit your irrigator in the included stand, and it will always be charged and ready to go! The ToiletTree Poseidon flosser is offered below in the Amazon section below together with the other flossers compared above. The Amazon prices shown were in effect at the time this article was written and may have changed. For exact price information, please click the product image links in the Amazon section below. Note also that the Amazon price often includes a good discount on the list price. If a discount exists, both the list price and the Amazon price will be shown when you click the product image links in the Amazon section below. So Which Water Flosser to Get? Pros: It has a larger tank, multiple tips, LED display, ten pressure settings and finger-tip easy pressure control. The flossing timer together with the 30-second pacer takes the guess work out of flossing. There is an innovative pulsation mode that provides maximum plaque removal and an enhanced gum stimulation mode that provides improved circulation. Cons: Not very convenient for travel. Amazon Customer Rating: 4.5 stars (out of 5 stars). Pros: No electric power required. Convenient and lightweight. Water pressure easily controlled by adjusting the faucet. Cons: It connects to faucets only after replacing the existing faucet aerator with the provided Oral Breeze valve adapter. The adapter screws in after you remove the bottom piece (aerator) from the sink faucet. Note that the Oral Breeze adapter will fit most standard faucets but not all faucets and therefore this flosser may not be suitable for travel as some hotels may not have compatible faucets. Amazon Customer Rating: 4 stars (out of 5 stars). Pros: Compact design that is convenient for travel. Rechargeable. Comes with multiple tips and a deluxe microfiber travel bag. Cons: Smaller tank. Only two water pressure settings. Pros: Compact design that is convenient for travel. Cons: Smaller tank. Not rechargeable, requires 2 AA batteries. Comes with only one tip. Only two water pressure settings. Pros: Compact design that is convenient for travel. Rechargeable. Comes with two tips. Three water pressure settings. As mentioned above, ToiletTree has more recently released a new cordless flosser, the ToiletTree Poseidon. It comes with the same features as the ToiletTree Cordless compared above. But it also comes with an inductive charging cradle. You just need to sit your irrigator in the included stand, and it will always be charged. The ToiletTree Poseidon flosser is offered below in the Amazon section together with the other flossers compared above. Now that you know all the facts about these very popular 5 water flossers, you should be able to choose the one that will respond best to your own flossing needs! Do you have enough counter space in the bathroom? Do you have sensitive gums that require precise pressure control? Do you need more than 1 cup of water in the tank to floss completely? Will many people in your family use the flosser?